You may also visit www.linksplayers.com to check out their available resources. Check back in the fall for additional study offerings. Church at the Red Door is layered beautifully with women who understand and love to minister to other women. Within the ranks of Church at the Red Door, we have women who have excelled for years as teachers, counselors and just simple confidants for life's journey. Do you have questions? Do you need a friend to walk alongside you in this life? We believe we have formed a women's group where you will find not only the answers to these questions, but deep and meaningful relationships as you go through the process. Come join our spring study starting on Wednesday, March 27. 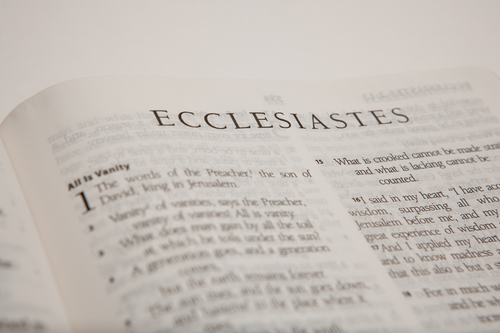 We will spend twelve weeks studying the book of Ecclesiastes. Study guide will be available at the first meeting and each subsequent meeting. Our study is open to all Church at the Red Door women and their friends. Who is the author? The title, which translate into Greek is ekklesiastes, comes from a Hebrew word for assembling. It suggests a type of office-bearer. Thus we have translations as "the Preacher," "the Speaker," "the Philosopher," and the one we will use in this study "the Teacher." The Teacher identifies himself as "son of David, king in Jerusalem". Such an identification naturally links him with the wisest of all Israel's sages, King Solomon. Many commentators believe the Teacher was not actually Solomon but wrote in the tradition and from the perspective of Solomon. The depth of insight found in the book would certainly argue for an author endowed with the kind of wisdom granted to Soloman and qualified as a star disciple of this master sage. What's the Point? The Teacher's message seems particularly aimed at the secularists--those who seek to find life's meaning outside of a practical faith in God. The author explores what he calls "life under the sun"---life outside of God's control and goodness. Questions: Does life really have meaning? Who is in control? What does it take to find satisfaction or even be content? How do we live wisely? Much of the time God is left out of the discussion. But when he gets introduced, everything changes. "Life under the sun" becomes "life from the hand of God." Chasing after meaning transforms into the pursuit of God. Links Players International The women already have numerous groups here in the Valley, and they would love to connect with you; however, all these studies are currently seasonal. Please check back in the fall for open studies and feel free to visit www.linksplayers.com for more information on their ministry. There are studies held throughout the year; this spring, we went thorugh the study "Love and Respect." If you are interested in attending the next couples study, please email Pastor Paul Berst and let him know. At Church at the Red Door, we strive to have everyone who wants to expand their walk and their discipleship knowledge to experience Rooted. Click here for more information and to register for the next study. Our studies are in full swing. Please email Pastor Paul Berst if you are interested in receiving more information.